Having greater control on the image is desired by photographers. The small imagers in todays HD cameras have a side effect of having a deep depth-of-field where foreground and background are all in focus. Good in some situations but when you want the viewer to look at just one part of the picture it presents a problem. Many aftermarket manufacturers devised adaptors to use prime (fixed focal length) lenses from cinema and still cameras on these HD cameras. It takes advantage of the larger image area to get shallower depth-of-field images. Letus is one of the leading companies that makes a line of adaptors. This one can accept Canon’s line of “FD” lenses that Peter Roof used earlier in his career as a still photographer. Roof already had a variety of focal lengths and will have a few more to round out the set. 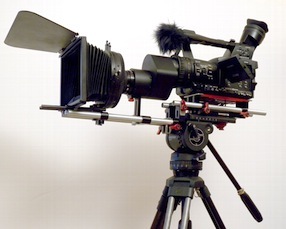 Available will be 24, 35, 50, 85, and 135mm lenses good for shooting wide shots, interviews, and tight shots.